A combination of powerful innovations – above all in the areas of robotics, artificial intelligence, and networking technology – are changing our lives. What I am describing in Box 1 is not some futuristic scenario from a sci-fi book, although it surely sounds like it. Instead, it is the world we live in. Today’s products are yesterday’s science fiction, and sometimes it even feels like today’s products are today’s science fiction. A few years ago, it started to become clear that increases in computing power and breakthroughs in machine learning were going to yield big dividends and transform many product markets. Although the benefits of these technologies are obvious and unquestionable, it is especially interesting for social scientists to examine whether the same developments also have a dark side for consumers. 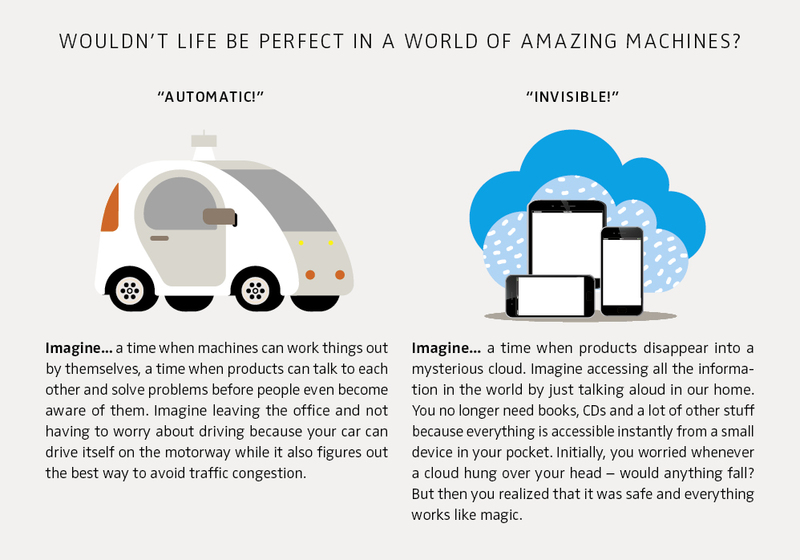 With the arrival of amazing machines, will we eventually lose something important? The key insight of our research is that the benefits brought to us by recent product innovations also come with potential burdens for people who are motivated to consume by identity motives – that is, by the desire to be the kind of person that they want to be. Free from the tyranny of chores … but what if the chores are “me”? Take the first vignette of Box 1 about autonomous products. Autonomous products free us from the tyranny of chores. Now products can take care of everyday activities like driving or cooking. This can relieve a burden and make our life easier. At the same time, what if those everyday activities are important for a person’s sense of self, for his or her identity? What if, for example, driving or cooking are not only activities pursued for utilitarian reasons but also activities that are in some way self-defining? Automated products can be unattractive when identity motives are an important driver of consumption. When consumption requires skill and effort, automation prevents consumers from attributing consumption outcomes to their own skill and effort, ultimately depriving identity-driven consumers of an important source of self-esteem and personal satisfaction. To illustrate, consider a bread-baking machine that can bake bread with minimal involvement from consumers. These machines can direct the user on ingredients, control temperature and set timing, and thus replace skills essential to one’s identity as a baker. When automation replaces skill or effort, it removes opportunities for consumers to feel that it was they who produced the bread. 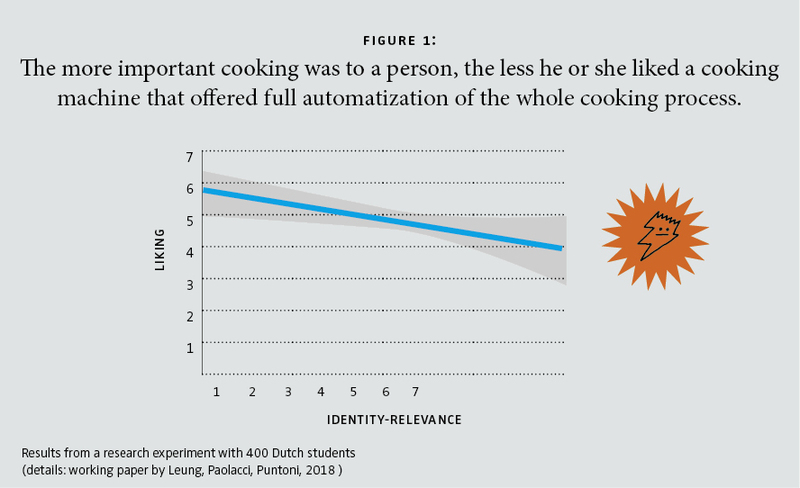 In other words, automation takes away from people who consume for identity reasons the possibility to attribute the outcome of consumption (e.g., the bread) to their own skill and effort. Consumers who strongly identify with a task are more inclined to resist automation than others, according to our studies outlined in Box 2. Automated products can be unattractive when identity motives are an important driver of consumption. Free from the tyranny of clutter … but what if the clutter is “me”? Take the second case in Box 1 of invisible products. In many industries, digitalization leads to “dematerialization.” The CD uses digital technology but still requires physical support. Instead, buying music on iTunes or streaming it from Spotify comes with no material artifact. Dematerialization frees us from the tyranny of clutter. For example, we can now consume culture like music, films and books in an empty home. This development makes life more comfortable and consumption more convenient. At the same time, what if those objects that are disappearing are important for establishing and maintaining one’s view of oneself? What if, for example, one’s books and music define a person’s taste and likes? Our research (Box 2) has also confirmed that identity-related consumption motives affect consumer preference for materiality. The consumption of certain products can be diagnostic of one’s identity and act as a signal for both oneself and others. For example, owning the entire catalogue of the Beatles might indicate that the music of the Beatles plays an important role in one’s life. Material products are superior to digital equivalents in terms of identity-signaling, according to our results. The sensory engagement that comes with material products gives consumers more power to signify their commitment; material products that you can see and hold are in a way “more real,” and so must be the identity associated with those products. In two projects on technology and identity-based consumer behavior, we investigated the relationship between shopping motives and technology. My collaborators in these projects were Maria Cristina Cito, from Bocconi University, and two colleagues from Erasmus University, Eugina Leung and Gabriele Paolacci. In a series of studies, we demonstrated that consumers who strongly identify with a particular social category tend to resist automation in identity-relevant products. We argued that theses strong identifiers should resist the automation of identity-relevant tasks and tested this in areas as diverse as driving, fishing, cycling and baking. For example, consumers’ willingness to accept the offer of a free battery pack when they buy a bicycle decreases with the extent that cycling is central to their identity. Similarly, people who agree with statements like “driving is an important part of who I am” are less likely to own a car with automatic transmission, even after controlling for driving expertise and other decision criteria. Automatic hook settings for fishing and multipurpose cooking machines produced similar results. In addition, we conducted a number of studies examining preferences for movies, books and music either in physical or dematerialized form. For example, we focused on consumers’ identities as gamers and offered them physical books or e-books about videogaming versus cooking. Regardless of whether we measured identification with gaming using self-reports or with the number of playing hours as a behavioral proxy, we found that the identity-relevance of a target book determined the likelihood of participants choosing the book versus e-book version. Strong identifiers preferred the material version of the book relevant to their identity (the book about videogames) but preferred the immaterial version of the product unrelated to their identity (the book about cooking). The same difference did not emerge for weak identifiers. Corroborating our theory, in other studies we also found that, while e-books score higher on functionality and reading pleasure, physical books scored higher than e-books in terms of the ability to signal and represent the identity of a person. Machines in the Internet of Things can perform an ever-increasing range of tasks on our behalf. The recent explosion in the power of computing and artificial intelligence will lead to the appearance of increasingly skillful products capable of autonomous decision-making and action. At the same time, the increasing range of tasks that can be carried out via digital services means that dematerialization is likely to transform consumer behavior in many domains. Amazing machines provide great efficiency gains, but our work suggests that they may not always be desirable. IoT adoption will be more likely when the associated tasks are less relevant for identity signaling. IoT adoption will be less likely when the associated tasks are relevant for identity signaling. People who consume for identity reasons, however, are not necessarily modern-day Luddites. Those who oppose IoT application in one context might willingly accept IoT applications in others with less personal relevance. Managers should not overlook that people’s quest for meaning in consumption remains an important driver of buying decisions even in our age of amazing machines. Physical products won’t completely disappear any time soon, especially when they are relevant for a person’s identity. Vinyl has made a remarkable comeback in the music industry, and it now seems that e-books will coexist alongside traditional books. Companies that do not go with the tide will still be competitors for business opportunities. And those who jump on the bandwagon of the IoT should not overlook that our life is not just about efficiency and being freed from seemingly inconvenient tasks, but also – and maybe now even more than ever – about leading a meaningful life. Cito, M. C.; Leung E.; Paolacci, G. and Puntoni S. (2018): “Dematerialization and Identity-based Consumer Behavior”, working paper. Leung, E.; Paolacci, G. and Puntoni S. (2018): “Man versus Machine: Resisting Automation in Identity-Based Consumer Behavior”, working paper. Reed A.; Forehand, M.; Puntoni, S. and Warlop L. (2012): “Identity-Based Consumer Behavior”, International Journal of Research in Marketing, Vol. 29 (4), 310-21.